It took a visit from a relative to finally prompt me to write a post on one of the restaurants in town that I most often visit. Then it dawned on me, and I started laughing. My aunt missed the accent mark, and, thinking like a true Minnesotan, she defaulted to Ole of “Ole and Lena” fame. We joked that it must be northern Mexican food, if the sign faked out a Minnesotan like that. We stopped at Olé for lunch, and I defaulted to my number-one favorite dish on the menu: the chile relleno. I am a bit of a chile relleno snob. It’s what I usually order at Mexican restaurants when it’s a menu option, but I am often disappointed. Too often, the dish arrives not-quite-right, with the breading on the chile soggy with grease. They skip the breading entirely and wrap their cheese-stuffed peppers in egg instead. Healthier! I like it! 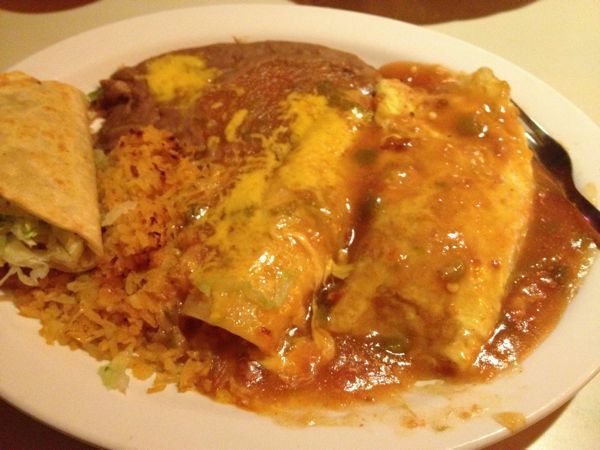 A note on ordering at Olé: when you get a platter meal, the server will ask you “green or red?” or sometimes “hot or mild?” This refers to the sauce slathered over the dish. The red sauce is the milder sauce. (It might be the same sauce that comes with the complimentary chips and bean dip?) The hotter green sauce is the pork chili that is so ubiquitous atop foods at the region’s Mexican restaurants. The server will also ask “corn or flour?” if your meal includes tortillas. 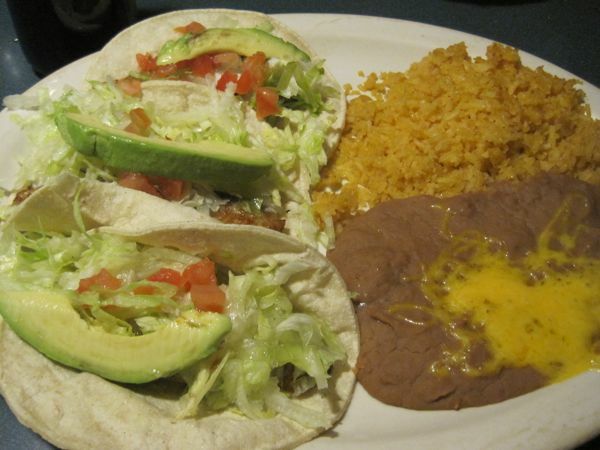 I have only ever ordered one other item at Olé aside from a chile relleno platter, and that was a special posted on the menu board at the front door: fish tacos. True to form, the fish chunks were not breaded – just sauteed au naturale. Yum yum! Bugman and I can often be spotted hoofing it down 20th Street towards Olé on a nice evening (sure wish there was a traffic light and pedestrian crossing at the highway there!). We can have a beer or two with our meal and enjoy the sunset on our walk back home. 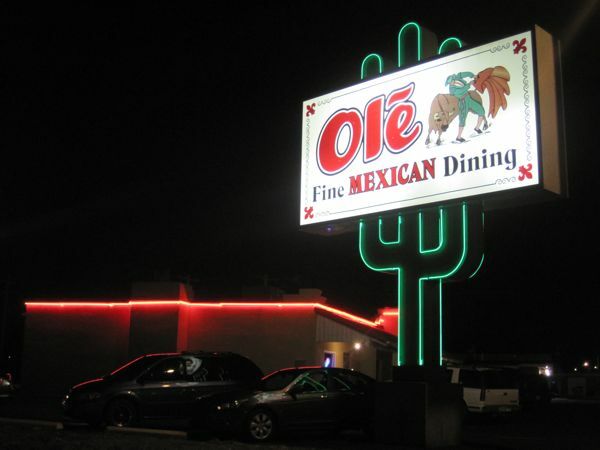 Olé is located at 1901 E. 20th Street (on the access road just east of Highway 26 near the Holiday Inn, Staples, and Pioneer vet clinic).